In the book ‘Pictures From Life In Field And Fen,’ photographer Peter Henry Emerson observes and records scenes of country life in East Anglia, England, which includes Norfolk, Suffolk, and part of Cambridgeshire. In 1884 he moved to Southwold in Suffolk and influenced by contemporary painters (notably Bastien-Lepage and Millet) he represented country figures acting characteristically. 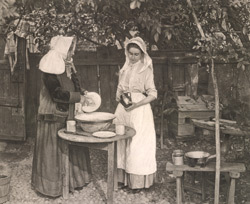 ‘Confessions,’ depicts an old woman and a young girl cleaning dishes in a fisherman’s cobbled yard. In the six page introduction on art history and aesthetics Emerson emphasises naturalism and argues for a "high and honourable place" for photography as a "fine art." He dedicates the book in memory of French inventor Niepce. "We have adopted a reproductive process for publishing these plates. This process is...an automatic etching on copper, as first discovered by Niepce."